It all comes down to stresses and strains of one sort or another. Almost everything about an oil painting will swell and contract, stiffen and flow, in response to the environment or physical handling. To make matters worse, the degree and nature of these changes will themselves change over time as the various materials undergo their own internal processes of aging. In the end, a stretched oil painting is a battleground of competing forces, a dynamic system constantly on the go. Toss into this arena the question of whether oils can be safely used over an acrylic ground, or even further, on top of acrylic paints and mediums, and one enters into a battleground of a different order altogether. Traditionalists and purists will decry the use of any modern materials, or else hint at dire results attributed to excessively wornout generalizations: that acrylics are too flexible, too closed, too untested or, more bluntly, just too new. Even while admitting the shortcomings of traditional preparations – after all, the vast number of oil paintings done throughout history have come to us cracked and in varying states of repair – they will often state their preferences as “better the devil you know than the devil you don’t.” By now one would think all these issues would have been completely resolved by conservation scientists, and best practices hammered out and well documented. But no. As we work to dispel many of the myths surrounding the use of acrylic grounds under oils, we simultaneously lay open new questions and avenues of inquiry that, for the time being at least, we can only fill with our best conjectures. Some of the most promising research into this area has been done through the lenses of mechanical engineering and material science. These fields have probed and prodded almost every physical aspect of a painting, and in the process have provided deep insights into how a painting functions as a system and what the requirements might be for making artwork that has a firmer footing and a more stable structure. Before exploring some of this territory, we need to understand the terms and decipher the graphs much of this research is couched in. 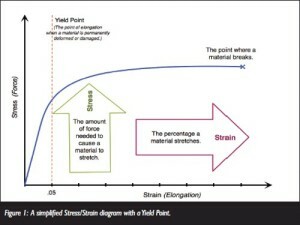 The most typical diagram one might find will show some form of a stressstrain curve, which is simply a way to measure how strong and flexible a material is, and when it is liable to break. In the first diagram on page 1 (Figure 1) the curved line represents the typical behavior of many materials when being stretched. At first the line rises steeply as a build-up of force is required to overcome its initial resistance and begin to elongate. Think about the effort one might need to initially lengthen a plastic grocery bag by pulling at it with both hands. At first there is a sense of resistance but eventually, once a person is pulling hard enough, the bag will begin to stretch for a ways until eventually it reaches a breaking point. If instead of a grocery bag one grabbed hold of an older, 12″ long film of oil paint, one might be able to stretch it just a 1/16″-1/8″ before it broke, while many acrylic paint films can elongate to twice their length or more in ambient conditions, so quite a difference. The amount of force one needed in order to elongate the material is called the ‘stress’, while the percentage the material stretches is known as the ‘strain’. A final concept that is important to know is called the ‘yield point’. This is the point when a material is stretched so far it can no longer return to its original shape and so is permanently deformed or damaged. For a wide range of artist materials and supports this is set at the extremely low level of just one half of one percent (.5%) and represents not only a practical limit but shows just how little an amount of strain is ever acceptable. 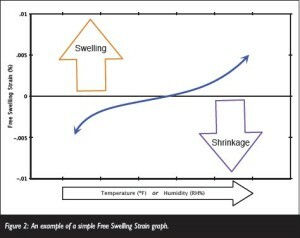 A second and more basic graph (Figure 2) shows the percentage of swelling or shrinkage a free, unrestrained film of material experiences when responding to changes in either temperature (°F) or relative humidity (RH%). By ‘unrestrained’ it is understood that the material is not inhibited in any way from growing or contracting in size. For example, imagine a piece of loose fabric or wood that swells and shrinks as the relative humidity in a room varies. By measuring these dimensional changes we can quantify just how responsive the material is. If we now imagine this same material as restrained in some way, say as a piece of stretched canvas, we can sense how the amount of tension will rise and fall as the canvas tightens and slackens, swells and shrinks, even though its outermost dimensions stay the same. In this way the measurement of free swelling strains are directly related to the amount of stress generated in a painting whenever there are changes in the environmental conditions. For oil painting, an ideal substrate should be more rigid than any of the subsequent grounds or paints that lay on top. Traditionally wooden panels and sometimes even copper plates were used for this purpose, and for the most part paintings done on these materials have survived in far better condition than others. An inflexible support will essentially help restrain the potential movements of the materials in response to environmental changes or physical handling. Even today, this remains the single most important piece of advice anyone can offer for creating a durable oil painting with the least risk of cracking or delamination. This is true whether the painting is done solely with oils or on top of acrylic grounds and paints. Complications arise the moment we turn our attention to paintings done on stretched cotton or linen since these materials are not simply more flexible but generally far more responsive to environmental changes. Traditionally, as a way to stabilize the fabric and protect its fibers from the harmful effects of oils, a size of hide glue would be applied, followed by an oil ground and finally, the actual paint itself. However, this seemingly simple sandwich of materials (canvas, glue, ground, paint) also generates highly complex interactions and divergent forces as they age and respond to the world around them. This area has been the focus of a wealth of contemporary research and those findings can help us look at the viability of acrylics as a component of an oil painting’s structure. By far the widest use of acrylics under oils is as a replacement for traditional grounds, and increasingly for fast drying underpaintings and textures as well. Certainly a large part of this trend is because acrylics are seen as convenient and easy to use, as well as a desire to lessen exposure to solvents. However, along with these positives, questions and concerns have dogged their use from the beginning and are generally grouped around three areas: the potential problems caused when materials respond differently to environmental changes, worries about adhesion, and the fact that acrylics are inherently more flexible than oils. We explore each of these in turn. It is often thought that a critical danger of using oils on top of acrylics is the potential for acrylics to swell or contract at rates so significantly different from oil paints and mediums that it would cause the overlying films to crack. This “fact” has been repeated so often and gone unqualified for so long that it has emerged as an unchallenged and generally accepted commonplace. In the process many people forget to ask if acrylics actually do, in fact, have such a different dimensional response? And if they did, under what circumstances? Fortunately in answering these questions we can draw from a significant body of research that has quantified how a wide range of materials might respond to environmental changes, with a focus on humidity and temperature in particular. In Figure 3 we have combined and simplified in one graph some of the many examples generated by Marion Mecklenburg, Senior Research Scientist at the Smithsonian Institution, in order to make comparisons more easily. 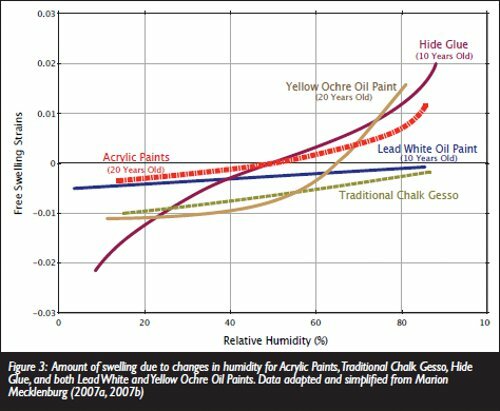 This diagram shows typical free-swelling strains in relationship to relative humidity for acrylic paints versus some common materials used in oil paintings. 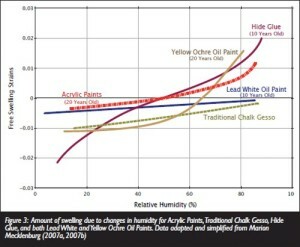 As we can see, over a very broad range of humidity, the 20 year old Acrylic Paints could swell or shrink by a total of about 1.5%, which is not widely different from the approximately 1% response found in traditional chalk gessoes, which are often considered one of the more stable grounds to work on. Hide Glue was by far the most responsive, showing a significant dimensional change of more than 4%, leading many researchers to identify this material as a major factor in the cracking and delamination seen in many older works. The Yellow Ochre is representative of more reactive oil paints made with earth colors rich in clay and can rise almost 3% overall, with almost two-thirds of that occurring just within 60-80% RH. This is far more movement than seen in the acrylic film and a very real cause for concern when looking at how oil paintings might respond to changes in humidity as many of these earth colors will be vulnerable to flaking and delamination as a result. Among the least responsive colors are the various whites in oil paints, such as the illustrated Lead White, which typically stays well within a very tight range of .5% or less. Along these lines, it is interesting to note that a recent study (Hagen, 2006) has shown matte latex housepaints containing high levels of solids respond far less to moisture than even this, to the point of being essentially inert to even extreme changes in humidity. If nothing else, this has reinforced our belief that matte acrylic paints and gessoes, which share many of these traits, could provide very stable surfaces for oils to adhere to and further investigations along these lines should be pursued. In contrast to humidity, dimensional changes brought about by fluctuations in temperature are extremely minimal and would pose almost no threat by themselves, which is not surprising given how few of these materials would be expected to appreciably swell or contract due to temperature alone. In general oils, acrylics, and hide glue can be expected to remain within a narrow .5% range. 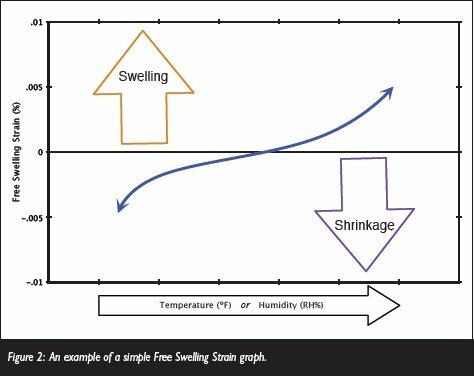 The graph on page 3 (Figure 4) shows a simplified view of free swelling data that would be considered typical over a range of temperatures. 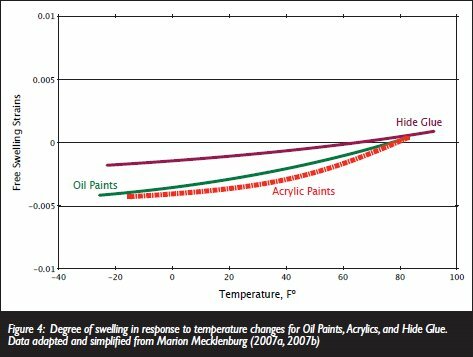 What is far more problematic is the increased embrittlement shared by oils, alkyds, and acrylics when subjected to low temperatures. Unlike the minor degrees of swelling or contraction we just saw, extreme embrittlement can put a painting at very high risk of fracture due to the build up of internal stresses alone, not to mention the mechanical stresses experienced during any amount of stretching, handling and transportation. What has been surprising, however, is just how well acrylics have performed given how they generally begin to stiffen dramatically below 50°F (10°C). 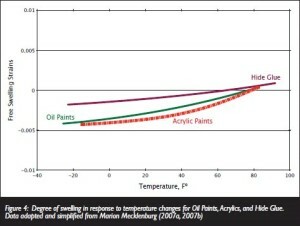 In fact, several studies comparing acrylic primers to current oil-based grounds, including ones based on oil-modified alkyds, have shown that the acrylic primers provided distinct advantages when looking at how much they could be flexed or stretched before cracking at both moderate and lower temperatures. One recent investigation that focused primarily on alkyd and acrylic-based grounds, went so far as stating fairly unequivocally that “alkyd-based oil primers present the most vulnerable type of primer for contemporary flexible supports” (Young, Hagen, 2008). Even at such moderate temperatures as 68°F (20°C) the study found that a linseed oilbased lead carbonate ground fractured when stretched as little as 1.6%, while the most flexible of the alkydbased grounds was able to sustain 9% elongation. However, by 50°F (10°C) those levels had dropped to .8% and 2.1% respectively. At 32°F (0°C), the lead white ground showed failure with just .4% strain, a level that can easily be expected with normal handling and movement. By contrast, GOLDEN Acrylic Gesso recorded a failure strain of 1% even at the much lower temperature 14°F (-10°C), while at 32°F it could still stretch 2.3% before fracturing, and by 50°F it had a strain-to-failure of 7.3%. This type of dramatic embrittlement of oilmodified alkyds was also noted in both past and current research (Erlebacher, 1992, Ploeger, 2009, Alba, 2010), where acrylics have consistently been shown to have a greater ability to elongate at low temperatures. 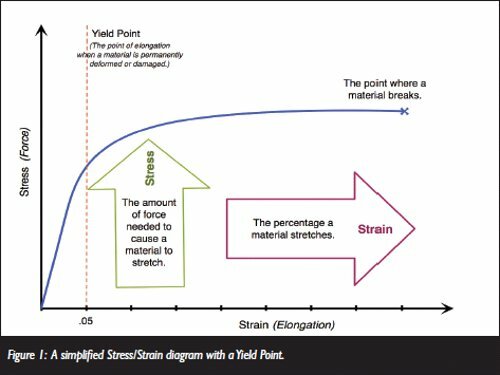 To make the sense of concern more concrete, and as a way to visualize the degree of strains we are talking about, a 25″x30″ painting would only need to be keyed out a scant 1/16″ to sustain a 1% or higher diagonal strain in the corners and a .5% strain when measured across the short side. This means that even at the moderate temperature of 50°F, some of the oil primers included in the above study would be at risk of cracking. While follow-up studies will ultimately be needed, for now at least it appears that some acrylic primers, such as GOLDEN Acrylic Gesso, could provide a foundation that is less prone to fracture when temperatures are 50°F or lower. That said, we still believe low temperatures present extremely high risks for all the paint systems covered and great caution is urged before subjecting any artwork to these conditions. The second major concern for most artists is simply whether oils can develop good adhesion to a range of acrylic grounds, paints and mediums. This is an area GOLDEN began to look into more than 15 years ago, and what follows is a review of those results as well as a look at some conservation studies that focused on the adhesion of oil paints containing zinc oxide. The first round of testing GOLDEN conducted was in the mid 1990s and involved creating 10 mil drawdowns of five oil paints (Indanthrone Blue, Ultramarine Blue, Mauve Blue Shade, Cobalt Turquoise, and Cobalt Blue Deep) over three distinct types of acrylic films: GOLDEN Gesso, Heavy Body Titanium White, and a mixture of two parts Self Leveling Clear Gel to one part Fluid Titanium White. This provided examples of a matte and toothy ground, a standard acrylic paint, and a very smooth and glossy layer of a tinted acrylic medium. There were 75 samples created, with 25 on top of each of the three different coatings. The samples were done on lacquered cards and kept in moderate, ambient conditions within the Lab facilities. Adhesion tests were carried out in accordance to ASTM 3559 and a few representative samples were aggressively flexed to the point of causing substantial cracking to see if the paint could then be cleaved off with the use of a scalpel. So far there has not been even one recorded case of failure, even when the oil paints were applied over very smooth and high gloss films. A second and much broader round of testing was started in 2006 and included 99 samples, each consisting of a 10 mil drawdown of oil paint over an equal thickness of GOLDEN Gesso. The oil paints included three colors (Yellow Ochre, Burnt Umber and Ivory Black) from three different professional brands applied straight from the tube, mixed 3:1 and 1:3 with an alkyd medium, blended 4:1 with bleached beeswax, and finally, thinned 1:4 with odorless mineral spirits and applied by brush as a thin wash. Following these applications, final or retouch varnishes made from damar or GOLDEN MSA Varnish were applied at different intervals. Crosshatch adhesion tests have subsequently been conducted and found no case was a failure ever found. As in the prior test, all the samples will continue to be monitored and retested over time. problem that went beyond the specific issues tied to zinc oxide itself, we would expect to see multiple failures occurring in these other samples as well. The conclusions in these studies were further amplified by a study on the cracking and delamination found in works by various Abstract Expressionists where zinc oxide oil grounds were used (Dawn et al, 2010). The fact that these issues were found in numerous examples completely unrelated to acrylic grounds further emphasizes that the problem resides in a structural weakness tied to zinc-rich oil paints independent of other factors. As was mentioned, the simple fact of painting on stretched fabric presents a problem for the oil painter who knows their paints will grow increasingly brittle with age while the cotton or linen continues to flex and strain, tighten and sag, just a few millimeters underfoot. The movements and stresses of a fabric support have been well charted by such researchers as Gustave Berger, Gerry Hedley, and Marion Mecklenburg. What has developed from much of these investigations is the fact that, as counterintuitive as it is, it is not the canvas but the more rigid sizing that supports the overlying ground and paints, and that by far, the greatest risks imposed on the structure are from the forces generated by the traditional hide glue sizing in response to humidity and the equally dangerous enbrittlement caused by low temperature. While hide glue continues to attract a lot of devotion from those working with traditional materials, the evidence pointing to its weaknesses and role in the cracking and delamination of paint films is substantial and convincing. Its one feature of merit, the exceptional strength it provides when kept within precise humidity ranges, is quickly overshadowed by its extreme hydroscopic nature and the fact that it quickly loses all strength above 75% RH and is no longer able to carry the amount of tension inherent in a stretched canvas. can see that it comes close to equaling the stiffness of hide glue at ambient conditions. 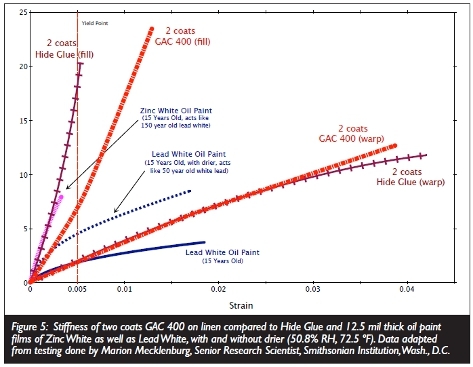 Figure 5 (page 5) presents a graph from testing done by Marion Mecklenburg showing 2 coats of GAC 400 applied to linen versus 2 coats of hide glue, alongside results from cast, free films of oil paints with a film thickness of 12.5 mil. The main drawbacks of GAC 400 is that it still falls short of the stiffness found in very old oil paint films, or even younger ones made with brittle pigments like zinc oxide, and in order to be fully water resistant at higher humidities it needs to be heat set by passing a hair drier set on high over the surface for several minutes. However, given that hide glue is so much more reactive, these trade-offs are something to consider if the piece will not be permanently kept under tightly controlled conditions. Acrylic Grounds: Impact of Thickness, Composite Structure, and Flexibility. When thinking about the degree of flexibility that acrylic grounds have, many people fall into the trap of thinking of a stretchy rubber-like film with brittle paint applied on top, then imagining that film being stretched until the paint cracks. But of course this is a spurious image at best simply because it has no practical relationship to the actual levels and types of stresses and strains a painting is likely to encounter. It is an image taken to a point of excess and caricature. Far more important is to understand how stiff or resistant to elongation a material is and to realize that being stiff does not necessarily mean a material is brittle. As an example, most metals can be bent and elongated; it simply takes a lot of force to do so. Or think of the impact that thickness alone can have on how we think about these ideas. Many materials, for example, can come both as thin films and as thick sheets or boards, with very differing amounts of resistance to being stretched or deformed. A very stretchy plastic wrap and a stiff cutting board can be made from the same type of plastic, but we think of them very differently if worried about how flexible they are as painting supports. And acrylics are no different. A thin film of acrylic paint will act differently, from a practical standpoint, than a substantially thicker one; a thin layer of medium differently then a 1/4″ thick slab of gel. 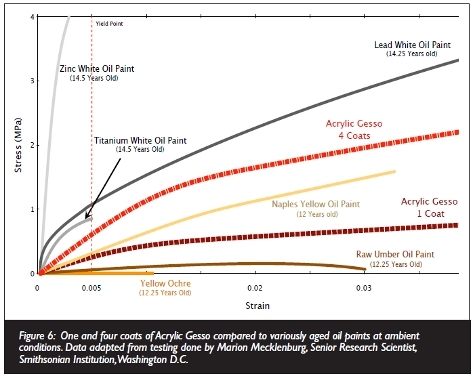 We see this effect at a small scale in the diagram above (Figure 6), where four coats of Acrylic Gesso begins to have the stiffness of older films of basic lead carbonate, and certainly remains stiffer than many other colors, such as Naples Yellow, Raw Umber and Yellow Ochre. Composite materials are also complicated in other ways. An acrylic gesso that normally by itself might be able to elongate more than 100%, when applied onto a fabric support that can be stretched a maximum of 31%, doesn’t all of a sudden increase the stretchiness of the fabric but, perhaps unexpectedly, reduces it even further, to a mere 12%, due to locking the fibers in place and thus stiffening the flexible fabric even further (Young, Hagan 2008). This effectively sets an upper limit of how much elongation any acrylic film might have when applied to a canvas support. And of course even this limit would never be reached in response to environmental changes or reasonable handling. A last point to bring up heads in a very different direction altogether and sees potential benefits in the inherent flexibility of acrylic grounds. In recently published research looking at composites of various grounds paired with various paints, a professional oil paint applied to GOLDEN Gesso proved extremely flexible, with no fracture observed even at 20% elongation and after subjecting the piece to 100 folds. This was performed on a relatively ‘young’ oil paint film of 2 years and it would be expected that with time the oil paint will embrittle and such degree of flexibility will be more unusual. Even so, it is instructive to compare this to the same oil paint on an oil-modified alkyd ground where cracking occurred when stretched 11.6%. As the oil paint is the same, the performance appears to be strongly correlated to the more brittle underlying ground layer. 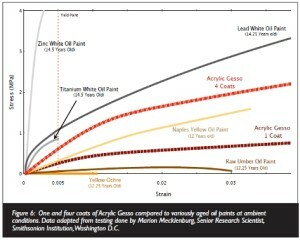 Further comparison of the performance of flexible acrylic gessoes versus stiffer alkyd grounds can be seen when considering their performance when alkyd paints are applied on top of each. As the authors of the study concluded, the “acrylic primings reduced the amount of cracking in the alkyd top layers, appearing to retard their normal brittle behavior.” If nothing else, these results suggest areas for new research into the possibility that flexible primings could actually have beneficial effects through some form of interfacial dynamics or stress reduction. So, in the end, the question remains: can one safely use oils on top of acrylics? And if so, what are the guidelines and best practices? We believe some concerns are overblown in the public’s mind, and not a cause for alarm, such as the amount acrylics might swell or shrink in response to normal environmental changes. Other areas, however, clearly warrant additional research to fully understand, such as the extreme brittleness displayed by alkyd and oil grounds at lower temperatures when compared to acrylic-based ones, or the apparent ability of acrylic grounds in some cases to lessen the brittleness of alkyds and oils applied on top. We continue to believe that adhesion of oils to acrylics per se is not a concern, while also recognizing that the problems being seen with oil-based products containing zinc oxide is very real and should lead painters to exercise great caution when using any of these paints. Indeed, in response to the research coming out, we have adjusted some Williamsburg Handmade Oil Colors to lower the percentage of zinc oxide in those mixtures where it is used, or eliminate it all together when possible. For now what constitutes a “safe level” of zinc is simply not known, and any level is merely a best-guess. While we have currently adopted 15% as a maximum, we also recognize future testing is needed for full confidence. Other things point to opportunities for updating our guidelines, such as applying multiple layers of an acrylic ground to achieve more stiffness, or simply reaffirmed long standing recommendations, such as the benefits of a toothy surface for assuring maximum adhesion. And lastly, there are areas where we recognize that improvements can be made, such as formulating an even stiffer size that can block oil while fully maintain the tension of stretched fabric, even at higher humidities. Visit www.goldenpaints.com/ technicaldata/techsheets.php for updated Product Info Sheets on best practices for using oils over acrylics and other issues related to acrylic grounds. Erlebacher, Jonah D., Eric Brown, Marion F. Mecklenburg, and Charles S. Tumosa. 1992. The Effects of Temperature and Relative Humidity on the Mechanical Properties of Modern Painting Materials. In Materials Issues in Art and Archaeology III: Symposium Held April 27-May 1, 1992, San Francisco, California, U.S.A, ed. Pamela B. Vandiver, James R. Druzik, George Segan Wheeler, and Ian C. Freestone, 359-70. Materials Research Society Symposium Proceedings. vol. 267, Pittsburgh, Pa.: Materials Research Society. Mecklenburg, Marion F., 2007b, Determining the Acceptable Ranges of Relative Humidity and Temperature in Museums and Galleries, Part 2, Structural Response to Temperature, http://eprints.sparaochbevara.se/165/., 1-29. https://repository.si.edu/handle/10088/7055.